1st Battery Artillery. This is most likely a Missouri State Militia battery. 2nd Battery Artillery. This is most likely a Missouri State Militia battery. Lovejoy’s Battery. A section with the 2nd Missouri Cavalry. Colonel, 3rd Colored Infantry? Or is this the 3rd Volunteer Infantry? We will try to sort this out below. 5th Missouri State Militia (M.S.M.) Cavalry. 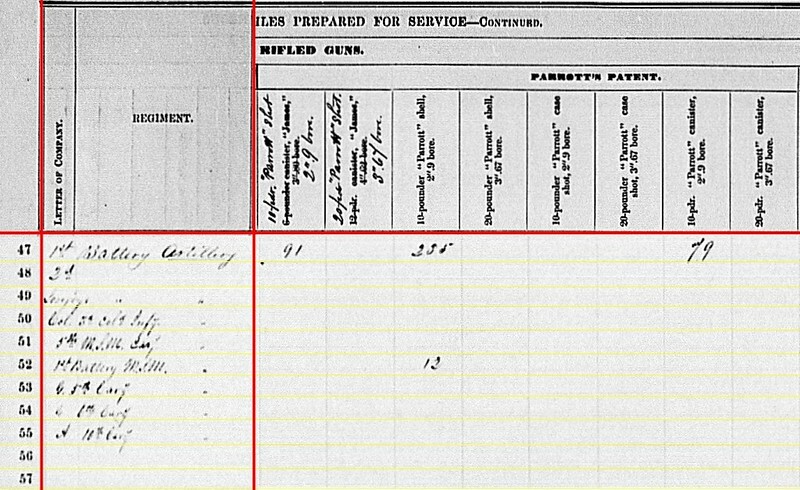 1st Battery Missouri State Militia: Appears to be a duplicate… we will sort out below. Company G, 5th Cavalry. But hold on… this isn’t the 5th Volunteer Cavalry, but I’ll save that explanation for the moment. So looking at lines 47, 48, and 52, we have some reconciliations to work. The Missouri State Adjutant-General’s report of 1862 identified two Missouri State Militia batteries then in service. The 1st was under Captain Horace B. Johnson. The 2nd was under Captain Albert Waschman (See note below). Johnson’s battery was armed with Woodruff guns, and is of some interest for that alone. This battery was closely associated with the 1st Cavalry, Missouri State Militia. 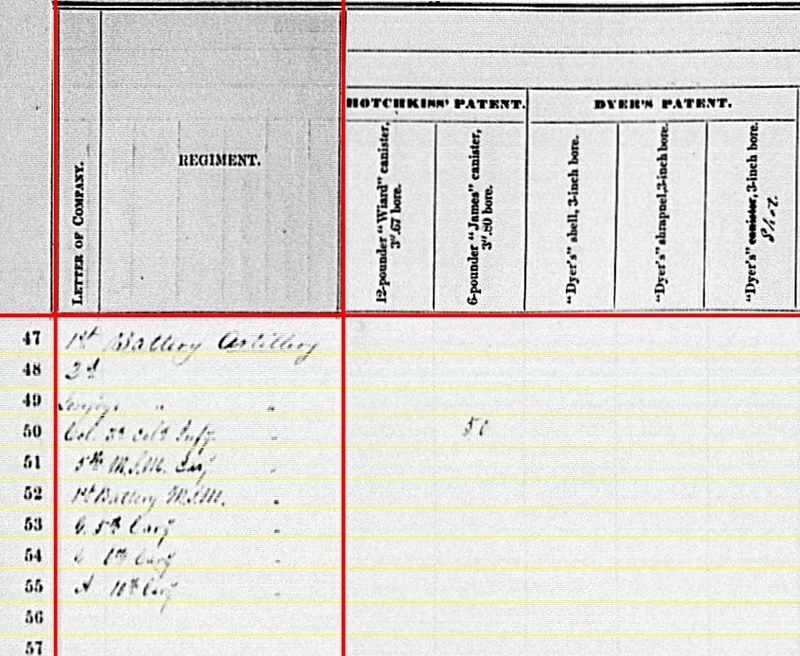 By December 1862, Johnson was formally in command of Company L of that regiment, and it appears his “battery” was incorporated in that company. At any rate, by the third quarter of 1863 the battery was not in existence… or at least was not in Federal service. 1st Battery Artillery was First Section, 1st Battery Light Artillery, Missouri State Militia (or simply 1st Battery M.S.M. ): Reporting at Sedalia, Missouri with two 12-pdr mountain howitzers and four 10-pdr Parrotts. Thurber was in command of this section. 2nd Battery Artillery: This was an obsolete line, left in because the clerks were confused (who wouldn’t be?) with the changes regarding Missouri State Militia. 1st Battery Missouri State Militia: Line 52 indicates duty at Westport, which matches with the Second Section, under Waschman. No guns listed. But we’ll see ammunition reported later. With respect to those “Parrott” rifles, if you look to the comments from last quarter’s post, there is a good thread identifying these as 2.9-inch English Rifles. Specifically Robert F. Mushet’s steel rifles, cast in Whales and bored out in London to an “off the books” purchase in October 1861. And, as alluded to in two earlier posts, Thurber’s Battery would soon be pulled into the 2nd Missouri Artillery Regiment reorganization as Battery L.
5th M.S.M. Cavalry: At Waynesville, with two 12-pdr mountain howitzers. The regimental headquarters was at Waynesville for some time before moving to Rolla in April. However, companies A, E, and H, under Major Waldemar Fischer remained at Waynesville. And going to the returns, we can pinpoint the officer in charge of these particular guns – Lieutenant John Sanger, of Company A. He was detailed to the section of howitzers starting in March, and remained with them until at least June 1864. At that time, he was ordered to take the howitzers (minus the men) to St. Louis. Sanger turned over the mountain howitzers and equipment to Colonel Nelson Cole, 2nd Missouri Artillery. So we’ll know where those cannon are going. I am going to track this as “Company A, 5th M.S.M. Cavalry“, however, for reasons that will appear below. Lines 49, 53, 54, and 55 all represent sections in volunteer cavalry regiments. Two of these carry over from the previous quarter. Lovejoy’s Battery/2nd Missouri Cavalry: Reporting at Brownsville, Arkansas with two 12-pdr mountain howitzers. Lieutenant George Lovejoy “commanded the regimental battery” of the 2nd Missouri Cavalry starting in June 1863, according to returns. Colonel Lewis Merrill commanded the regiment. But while Merrill served as commander of First Brigade, First Cavalry Division, District of Southeast Missouri (later transferred to the Department of Arkansas), Major Garrison Harker led the regiment. The regiment, and battery, saw action on the advance to Little Rock in August and September 1863. And their location given is valid for the end of that month. Company G, 5th Missouri Cavalry: Reporting at Houston, Texas County, Missouri (rather specific), with two 12-pdr mountain howitzers. Well, let’s hold off on that identification. The 5th Missouri consolidated with the 4th Missouri Cavalry in November 1862. And as far as I can tell, the 5th was never posted around Houston. BUT…. recall the 5th M.S.M. Cavalry (above) indeed had detachments at Houston. And through the fall of 1863, Company G of the 5th M.S.M. was posted at that town. Captain Thomas Thomas commanded the company. I don’t know who, specifically, managed the howitzers. But we will track this as Company G, 5th M.S.M. Cavalry. Company G, 6th Missouri Cavalry: Reporting at Carrollton, Louisiana with four 12-pdr mountain howitzers. After Vicksburg, the 6th Missouri Cavalry remained with Thirteenth Corps as it transferred to the Department of the Gulf. The regiment was active on several expeditions in lower Louisiana. But I cannot specifically place it at Carrollton (New Orleans) in the time period, just generally “around” in the theater of operations. Furthermore, I have not located any references to confirm the presence of howitzers with the regiment. Company A, 10th Missouri Cavalry: At Memphis, Tennessee with four 12-pdr mountain howitzers. The 10th Missouri Cavalry was assigned to the Sixteenth Corps at the start of the summer. Lieutenant Peter Joyce of Company A had charge of two sections of mountain howitzers. These were cited as “The Banshees” in some accounts of action outside Iuka, Mississippi. I interpret this to read “Col. 3rd Col’d Infy.” or Colonel, 3rd Colored Infantry. Missouri did raise regiments of colored troops, designated as such and attributed to the state. But those were soon re-designated in the USCT system. The 3rd Missouri Colored Infantry began organizing at Benton Barracks, St. Louis, in December 1863. But the regiment was not mustered until February the following year. And in March, the regiment became the 67th US Colored Troops. Thus it is not likely the 3rd Missouri Colored, even as the 67th USCT, are the unit represented by that line. The other candidate here is the 3rd Missouri Infantry. As part of the Fifteenth Corps, after Vicksburg the 3rd Missouri remained around Vicksburg. The regiment moved with its parent formation to reinforce Chattanooga. And there is no record of artillery assigned to this regiment. So let’s rule them out. 3rd Colored Infantry: Reporting at Goodrich’s Landing, Louisiana with two 6-pdr field guns, two 12-pdr field howitzers, and two 3.80-inch James rifles. A full, but mixed, battery. So of those nine lines, I think we have solid identification, down to the officer in charge, for five units. Of the others, one didn’t exist (2nd M.S.M. Battery). 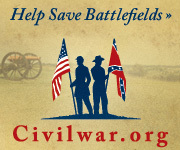 Two others are clearly attributed properly to cavalry sections. Only the 3rd Colored Infantry defies specific identification. Not bad for the mysterious Missouri batteries. 1st Section, 1st M.S.M. Battery: 36 shell, 50 case, and 40 canister for 12-pdr mountain howitzers. Lovejoy’s Battery, 2nd Cavalry: 14 shell, 44 case, and 11 canister for 12-pdr mountain howitzers. 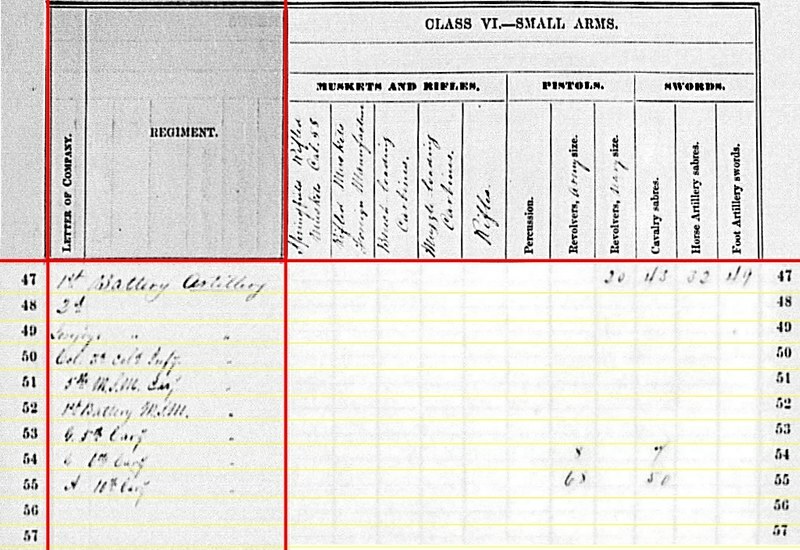 3rd Colored Infantry: 25 shot, 125 case, and 170 canister for 6-pdr field guns; 157 canister for 12-pdr field howitzers. Company A, 5th M.S.M. Cavalry: 67 shell and 126 case for 12-pdr mountain howitzers. Company G, 5th M.S.M. Cavalry: 108 case for 12-pdr mountain howitzers. Company G, 6th Cavalry: 24 shell and 26 canister for 12-pdr mountain howitzers. Company A, 10th Cavalry: 72 shell, 203 case, and 102 canister for 12-pdr mountain howitzers. 3rd Colored Infantry: 90 bullet shell for 3.80-inch rifles. 3rd Colored Infantry: 50 canister for 3.80-inch James. 1st Section, 1st M.S.M. Battery: 91 shot, 255 shell, and 79 canister for 2.9-inch rifles. 2nd Section, 1st M.S.M. Battery: 12 shell for 2.9-inch rifles. These entries seem to imply the rifled guns were distributed between the sections. Though I would also point out, these were not Parrott rounds, but rather rounds purchased for those English rifles. I think the clerks simply used the Parrott columns as a handy expedient in the accounting. 1st M.S.M. Battery: Twenty navy revolvers, forty-three cavalry sabers, thirty-two horse artillery sabers, and forty-nine foot artillery swords. Company G, 6th Cavalry: Eight Army revolvers and seven cavalry sabers. Company A, 10th Cavalry: Sixty-eight Army revolvers and fifty cavalry sabers. This post has run longer than most of in the summary series. I figured it best to take the time to break down the different units by type and at the same time properly attribute the lines to units. If nothing else, it’s fun to relate these numbers to names. Note: The proper spelling of Albert Waschman’s name is, in my opinion, up for debate. We find several derivations in the military records – Wachsman, Waschsman, Wachman, and others. However, most state records have it as Waschman. And his grave stone says Waschman (which… if there’s anyplace the name would be correct, it has to be the gravestone). So I’m convinced Waschman is the proper spelling. I’ve circled back to old posts to make that consistent here on the blog. If I missed any, please let me know. Waschman, by the way, was the son-in-law of Jim Bridger, noted “mountain man” and subject of a great Johnny Horton ballad that I’ll leave in your head.